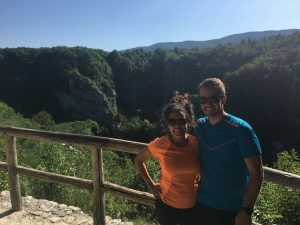 Plitvice Lakes National Park is a very popular day trip from many Croatian cities, and it was one of the main reasons we wanted to go to Croatia. 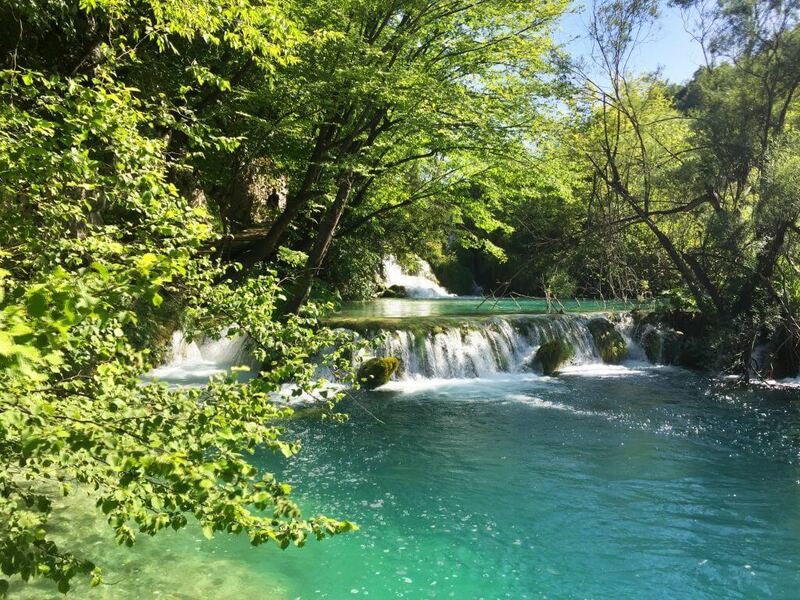 We did the day trip from Zagreb, but you can also do day trips to Plitvice from Zadar and Split to name a few. 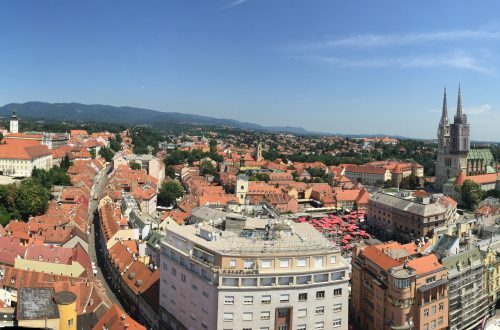 For the day trip, we took a bus to and from Plitvice from the main station in Zagreb. bought the bus tickets ahead of time, but you do not need to buy your ticket to the park until you get there. It is $10 to $45 for a one-day ticket depending on what time of the year you go. 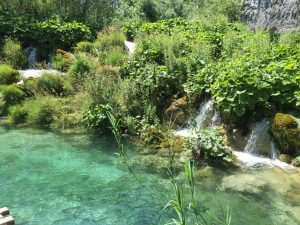 Check out the Plitvice Lakes National Park website here for more information. Since this was a day trip, we did not have to stay anywhere. 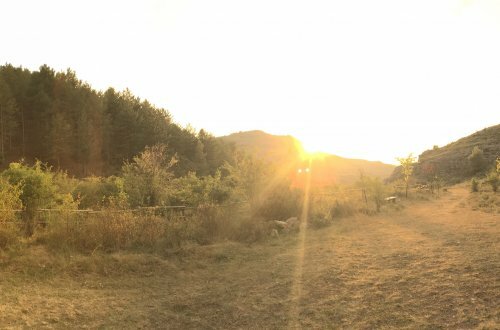 However, there are hostels, hotels, and airbnbs right in the National Park area if you would like to spend the night. 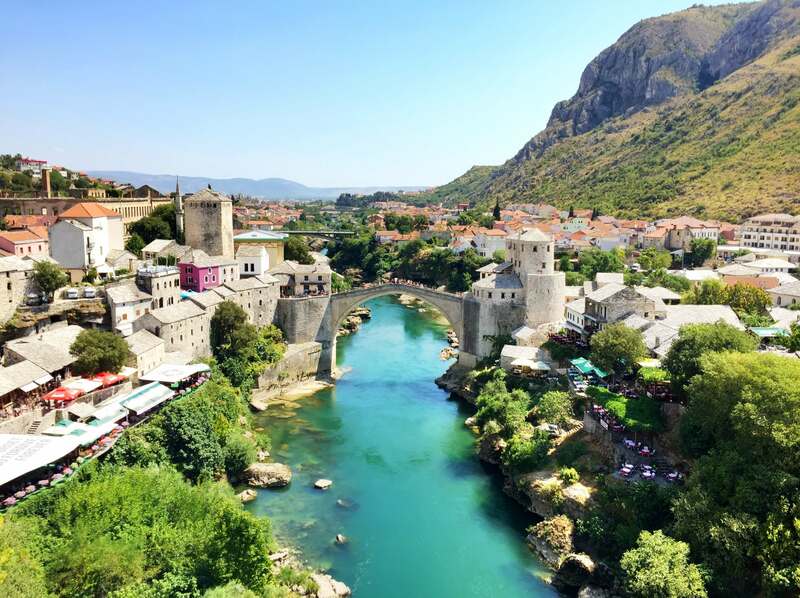 Before you take off for Plitvice Lakes National Park make sure you get some food to take along. There are only a few places to eat in the park by the rest stop areas. They have sandwiches and snacks that you can buy to take with you on the hike. 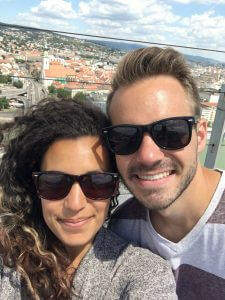 The day before we were able to go to a grocery store in Zagreb to get some snacks to bring along, which we highly recommend because it’s much cheaper than buying food in the National Park. Once our bus arrived we hopped off and got in line. Since we visited in July, it was peak season, and the line was long. If you go during this time of year, expect there to be a long line. We recommend you get there as early as possible in order to maximize your time at the park. We got there pretty early but still had to wait in line for about 45 minutes to get in. Once we got in, we decided to do the longest hike possible in order to see most as much of the park as we could. No matter which hike you decide to do, make sure you watch the time so you can get back to the bus in time. 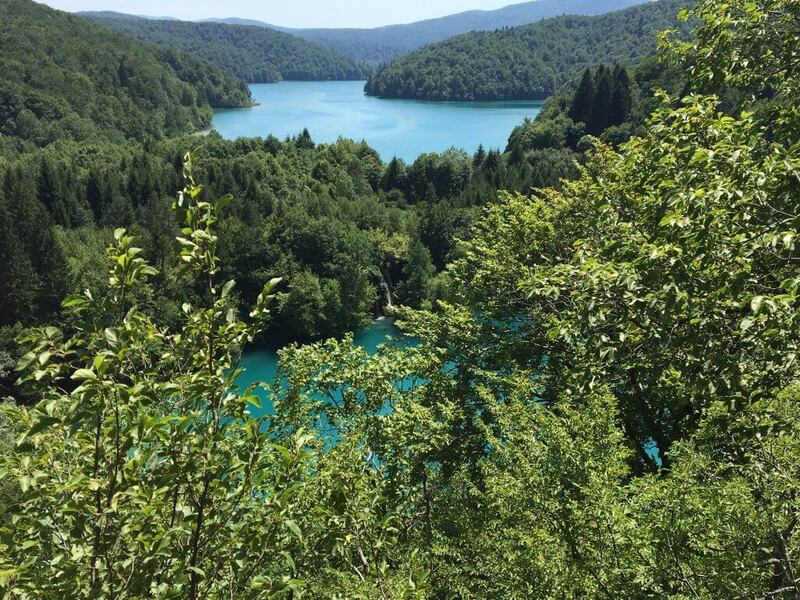 If you miss it, you’ll be stuck in Plitviče Lakes for the night. Our ambitious hike was about 10 hours. Luckily, it was pretty easy to do the whole thing while keeping an easy pace. Part of the path was blocked due to flooding, but there was an alternative path. While our hiking path was the least traveled, you do have to cross, and hike on parts of more heavily traveled paths. Beware of all the tour groups because they can definitely slow you up. This was especially true at the beginning of the hike. The entire hike was beyond beautiful, and there wasn’t a dull moment. Whether we were hiking on a boardwalk inches above the crystal clear turquoise pools of water or hiking up a tall side of a cliff through a lush, green forest, all the scenery was incredible. If you can, try to see as much of the park as possible. It’s well worth it! 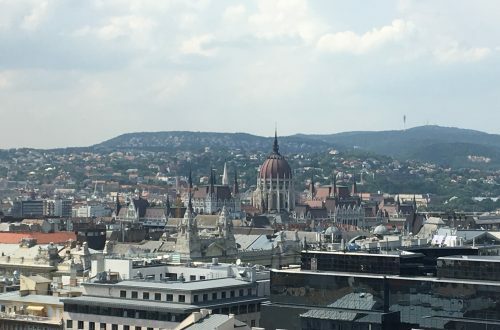 We made it back to our bus with plenty of time to spare and got a small, not too delicious sandwich in the park cafe before we slept the entire way back to Zagreb. 1. 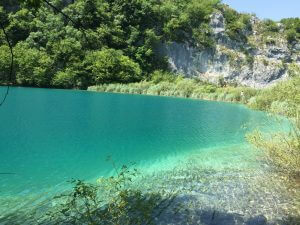 Bring food and snacks with you to avoid buying more expensive food in Plitvice Lakes. 2. Get there as early as possible. 3. Make sure you watch the time so you can get back to the bus in time. 4. Beware of all the tour groups as they might slow your pace down. 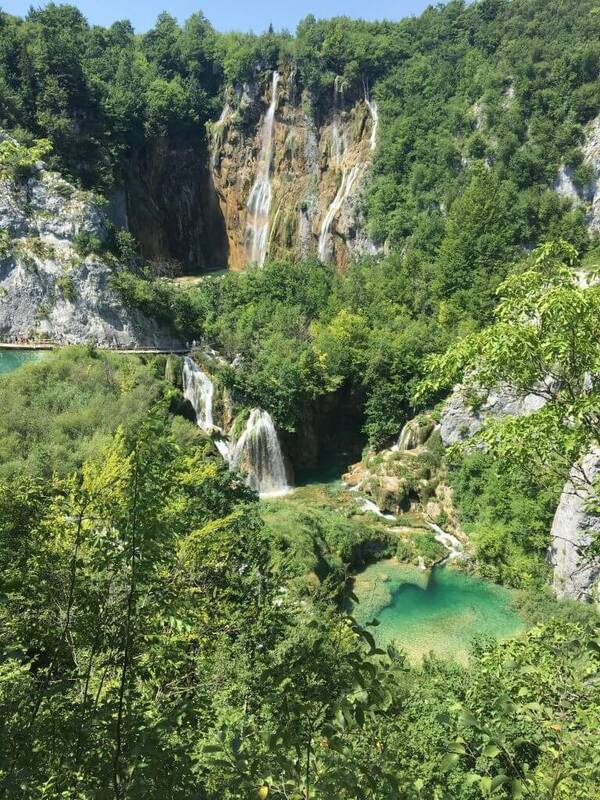 Please share any tips, advice, or recommendations for a day trip to Plitvice Lakes National Park in the comments! Hi, nice article. 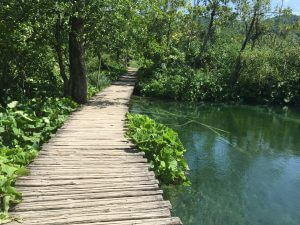 I’m looking for some assistance to plan my trip to Plitvice. I’ll be traveling there at the end of March, but instead of returning to Zagreb I’d like to go to Split. I saw there’s a bus that leaves the park around 23 30, is it viable to stay there up to that time? Hi Emilio! The park itself is only open until 18:00. You might be able to stay outside the park or walk to a nearby hotel and hangout there.